The information listed here is updated in real time by Motoscafisti Capri. It is not possible to guarantee ahead of time and with certainty if the grotto will be open or closed. Each morning at 9 am, the skippers arrive at the mouth of the cave and evaluate if it is safe to enter. Hop aboard a wooden rowboat, lay back, and let yourself be carried through a tiny stone portal to another world by your able skipper, who navigates seamlessly under the meter-high cave mouth. Inside, pass from complete darkness into a sparkling cavern, lit by azure blue light, while the sounds of ancient Neapolitan song echo along the stone walls. You are in the Blue Grotto. These photos have not been retouched: inside, the water is exactly as you see here, a crystalline blue with silver reflections. Less than floating on water, you feel as if you are suspended in the heavens. 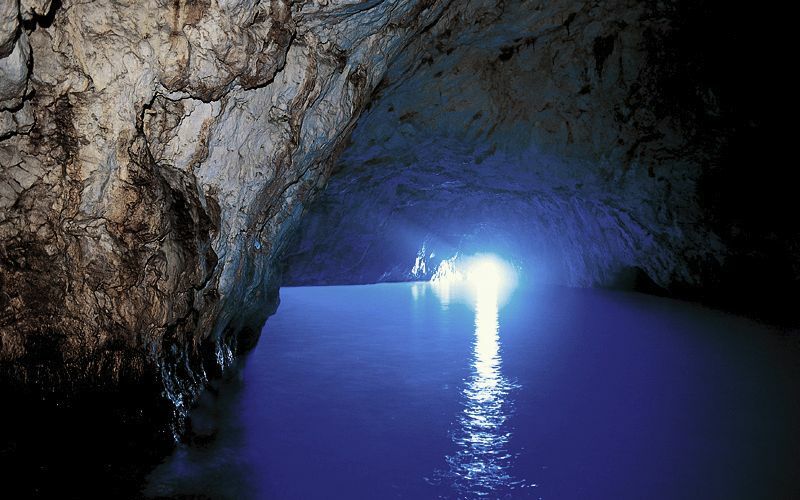 At least once in your lifetime, you should experience this marvel of nature and see firsthand why the Grotta Azzura is the most famous sight on Capri island. 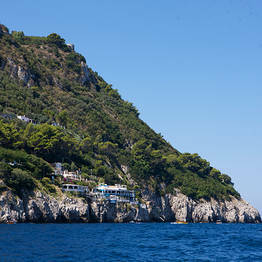 Getting there: by bus from Anacapri or by boat Marina Grande. Opening hours: each day from 9:00 a.m. to 5:00 p.m., with favorable sea conditions (in case of certain high winds, the cave mouth is inaccessible). 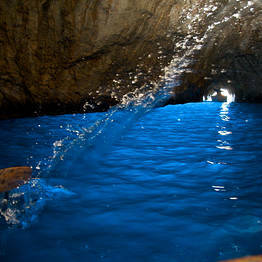 Entrance fee: EUR 15/person (the Blue Grotto is a cultural site and entrance fees are equivalent to those of a museum). 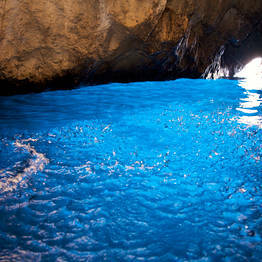 The Blue Grotto is a natural sea cave, 60 meters long and 25 meters wide . 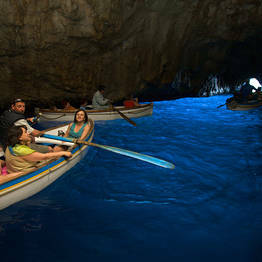 The cave mouth is two meters wide but only roughly a meter high, so to enter visitors must board small rowboats which transport a maximum of four passengers. The skipper will have you lay back along the bottom of the boat while he guides you through the opening using a metal chain attached to the cave walls. How do I get to the Blue Grotto? With a tour boat: at Marina Grande's port, you can purchase tickets for tours of the island by sea or a roundtrip ticket to the Blue Grotto at the ticket offices of the Motoscafisti and Laser Capri charter companies. If you purchase the "Island Tour by Sea + Stop at the Grotto", the tour boat will take you on a complete tour of the entire island including a stop at the entrance to the Blue Grotto. 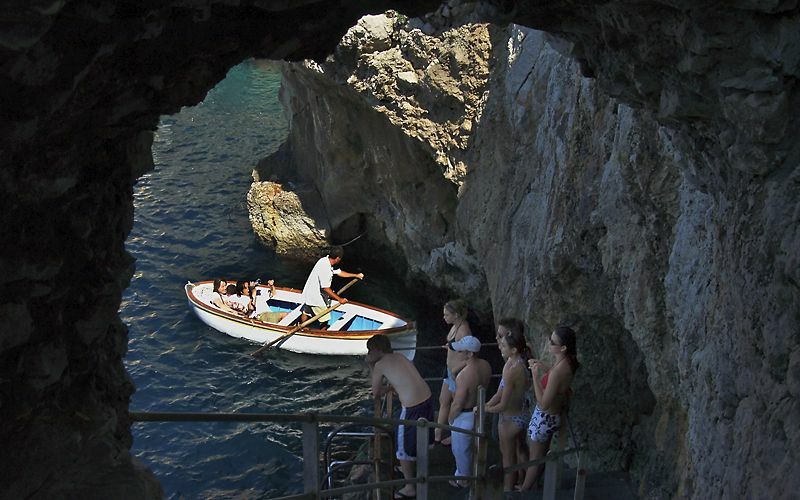 Here you will have to disembark from your tour boat and take one of the small rowboats to enter the cave itself. With a private boat: if you are visiting Capri island with your own private boat and want to tour the Blue Grotto, you can anchor at the buoys near the cave and signal to one of the waiting rowboats to be picked up. You can also hire a private gozzo with skipper from Marina Grande. These traditional island boats carry a maximum of seven passengers (thought there are larger versions available, as well) and the rate for a two hour tour is from EUR 150. Walking or by bus: from the center of Anacapri, first walk down Via Pagliaro then down Via Grotta Azzurra (3.5 km). There is also a public bus which leaves from Piazza della Pace. From the final stop, take the stairs down to the seaside where there is the queue to the rowboats. Along the stairs, there is a small concession stand (open only in summer) which sells drinks, snacks, and souvenirs. The famous light that illuminates the inside of the cavern is at its strongest between noon and two in the afternoon, though the reflections are spectacular all through the morning hours. Avoid visiting the grotto on heavily overcast days (when the effect of the sunlight inside the cave is much less dramatic). There is often less of a wait in the afternoon (after 3:00 p.m.), but the seas can become rough resulting in the cave closing to the public. How much does it cost to enter the Blue Grotto Capri? Tickets cost EUR 15 and are purchased from the floating ticket office (EUR 11 for the rowboat plus EUR 4 for entry). Discounts: Children entrance under 6 years old: free. For citizens of the European Union younger than 18 entry is free, so tickets must be purchased solely for the rowboat (EUR 11). For citizens of the European Union between 18 and 25 years of age, there is a discount of 50% on the entry ticket, so the total cost is EUR 12. 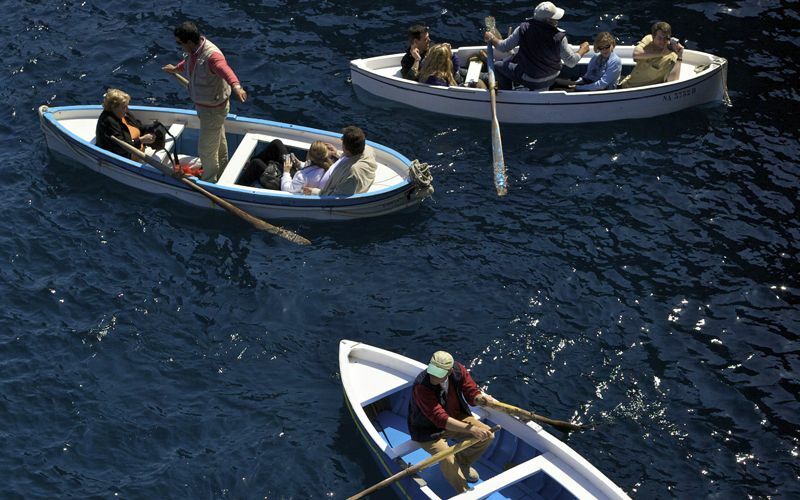 Tickets for the Blue Grotto are in addition to tickets for boat tours from Marina Grande. For boat tours by sea of the island, the ticket price per person is EUR 17; for simply a roundtrip transfer to and from the Blue Grotto, the price per person is EUR 14. The rowboat skippers who take visitors inside the grotto usually ask for a tip, though this is is at the discretion of passengers. Can I swim inside the grotto? Visitors are not allowed to swim into the grotto or dive from rowboats to swim inside the cavern. 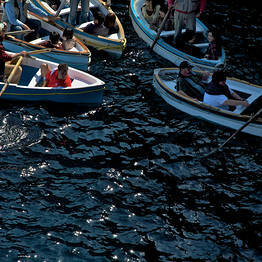 Many visitors wait until after 5:30 p.m. when the rowboats leave and the ticket office closes to swim inside. This is illegal and dangerous, as the high waves can slam swimmers against the stone of the low cave mouth. How do I visit the Blue Grotto with kids? 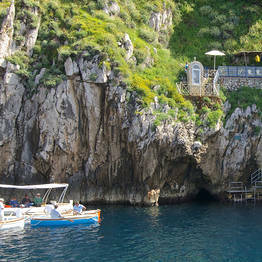 There is no minimum age to visit the Blue Grotto, though the use of rowboats to gain access to the cave can be hard on small children and infants, as there is often a long wait under the sun. 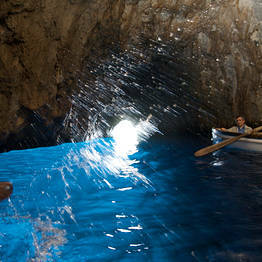 The visit inside the grotto on rowboats lasts about five minutes. However, the wait to enter the cave can be long, reaching an hour during high season at peak times of the day. The average time for a tour of the island by sea plus a visit to the Blue Grotto is about two hours. For a simple roundtrip transfer and visit to the cave, plan for about an hour. How do I know if the Grotto is open or closed? In case of strong winds or rough seas, entrance to the grotto will be suspended; often, the grotto will open and close a number of times on the same day when the weather is unstable. Unfortunately, it's hard to forecast closures due to weather, though if the weather forecast reports rough seas, the grotto will probably be closed. To check on up-to-date closures, call the Motoscafisti di Capri pier at 081 8375646 after 9 am. Is the Grotto open in winter? In case of mild weather, the Blue Grotto is open during the winter months. That said, the grotto is often closed between November and the beginning of March due to adverse weather conditions. If you are visiting during the winter, you can check up-to-date closures at the Marina Grande port by asking at the ticket windows for Laser Capri (Pier 21) or Motoscafisti di Capri (Pier 0), or by calling the Motoscafisti di Capri pier at 081 8375646 after 9 am. If both ticket offices are closed and no one answers the telephone, the grotto is closed. Why is the Blue Grotto so, um, blue? The bright azzure color of the water inside the cave is due to the sunlight which enters the cavern through an underwater opening which is positioned exactly under the cave's mouth. As the light passes through the water, the red reflections are filtered out and only the blue enter the cave itself. The famous silver reflections of objects in the water are caused by tiny bubbles covering the outside of objects underwater, which causes the light to refract differently than that of the surrounding water and causes this silvery effect. What is the history of the grotto? During the reign of Tiberius in Roman times, the grotto was used as a marine temple, and ancient Roman statues found here are now on display at the Casa Rossa in Anacapri. 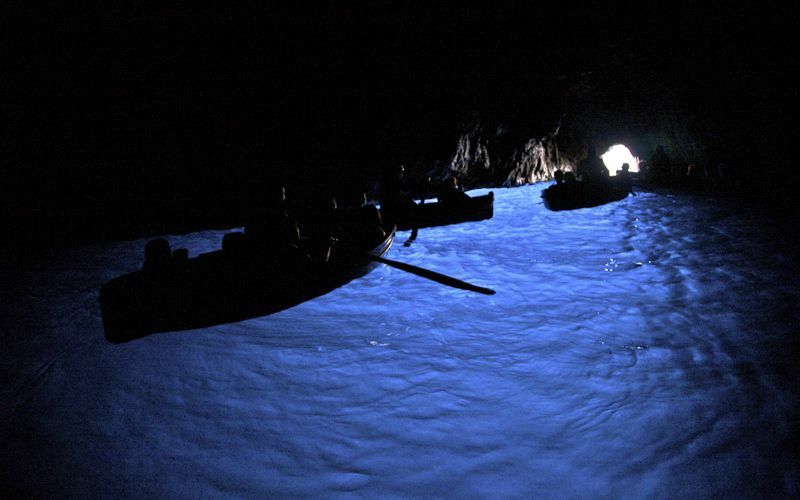 For many years afterwards, the Blue Grotto was avoided by sailors, as local legends told of spirits and demons living there. 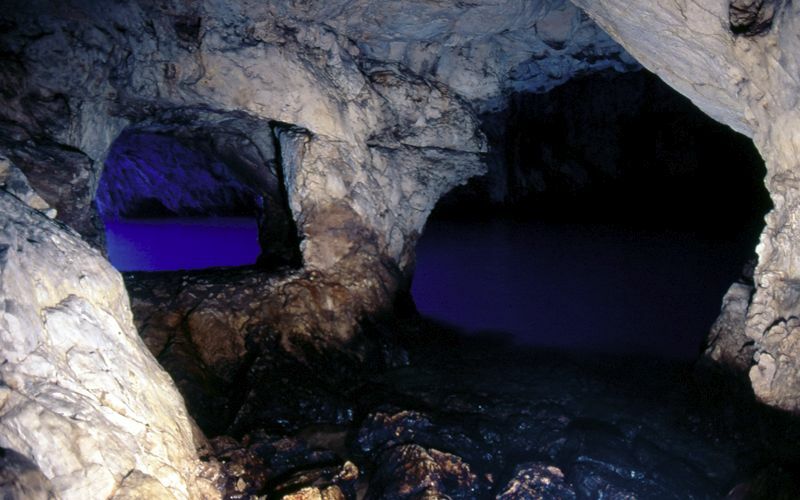 One day in 1826, however, local fisherman Angelo Ferraro accompanied German author August Kopisch and painter Ernst Fries to the cave, and their tales of its marvels have led to the grotto being one of the must-see sights on any visitor to Capri's itinerary. Boat: 10 minutes from Marina Grande or as a stop along an island tour by boat. Bus: From the stop at Anacapri, 50 meters from Piazza Vittoria (a 15 minute ride). Foot: From Viale T. de Tommaso, take Via Pagliaro and then Via Grotta Azzurra (3.5 km, 40 minutes).